It is such a blessing for me to see the growth and development in our young children each day. I love to walk through our classrooms and see their smiling faces as they actively discover the world around them and interact with their peers. My goal is that all young children at Divine Savior thrive in an excellent learning environment where they learn about their Savior each day and develop a strong foundation on which their future success can be built. I look forward to partnering with you as we guide your child through this essential stage in life. It is an absolute joy for us to serve the young children of our community and to provide them with the best early education experience possible. We are committed to partnering with parents in the process of building a strong foundation for each child’s future success. In the preschool, kindergarten, and first grade classrooms, you will find caring teachers who create positive, loving, and Christian learning environments. 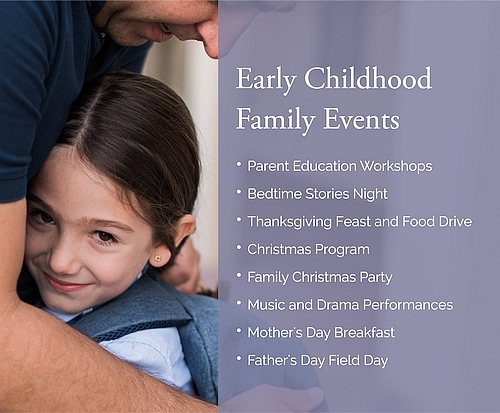 Our early childhood program is based on the philosophy that children are most successful when they encounter learning experiences that are active, hands-on, and developmentally appropriate. There is also a focus on fostering young children’s development in each area: emotional, social, physical, cognitive, and spiritual. The early childhood program at DSA is founded on research-based, developmentally-appropriate practices. This means that all aspects of our program are age-appropriate, culturally-appropriate, and individually- appropriate. In order for optimal growth to take place, children must engage in learning experiences that match who they are as individuals as well as their current state of development. Each child is unique and is guided through the educational journey in a way that meets his or her personal needs. Instruction is tailored to support each child as they climb the ladder of development. We participate in our learning. During the early childhood years, children learn best when they are allowed to observe, explore, and experiment with their environment. Teachers intentionally plan learning experiences that allow children to actively participate, using multiple senses whenever possible. We provide the materials, environment, and support that children need in order to continue their developmental growth. These active learning experiences help children to form the foundation of their science, math, and literacy. Our philosophy of early childhood education aligns with the vast research which states that children's play is critical to their development. Children's play scenarios provide the vehicle through which children implement, practice, and extend their learning. Teachers intentionally create a play-based learning routine that encourages children's interactions with one another and fosters critical-thinking and problem-solving skills. We love to have our parents and caregivers involved at school. We join together to celebrate our students' successes, watch them compete, and cheer them on as they perform. Families get involved by chaperoning field trips, volunteering with our Parent Teacher Organization, or helping us support our communities through the service we offer on campus. 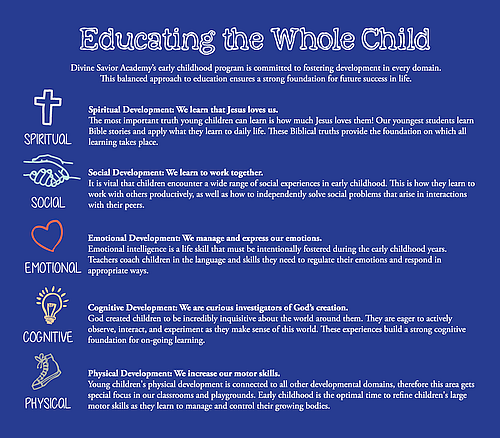 Divine Savior Academy offers a variety of after-school educational experiences for our early childhood students. Whether it's art or a sport, drama or a club, we give our students the chance to explore their interests in a fun learning environment. We're constantly growing and evaluating our programs. 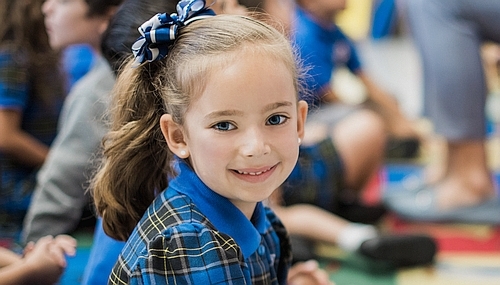 For a complete listing of fine arts, athletics, and extracurricular opportunities on the Doral campus, please contact our school office at 305-597-4545.